The recommended cook times are hours too long. I’ve found that the meats get overcooked, stringy, and dry. I’ve found that the vegetables get too soft and unappetizing to the eyes. Sometimes some ingredients become overcooked while others stay undercooked. The dishes tend to become too watery and the flavours get washed out. The typical slow cooker recipes use a lot of processed foods for ingredients and tend to be very high in sodium and/or fat. Even on high heat, I have difficulty reducing liquids or creating sauces in the slow cooker. I’ve tried two different brands of slow cookers, but it’s possible that the newer ones don’t have this problem. Since the food in my slow cooker has never reached a full or rolling boil, a small part of me still questions whether or not it is possible to get food poisoning from cooking pork or chicken in the slow cooker. Most slow cooker dishes tend to be easy, one-pot meals that don’t require much attention. Not having to cook over a stove top is great during the warmer months. Using a slow cooker frees up your stove top and oven for when you’re cooking for a crowd. It’s an easy way to make a dish that can serve many people. Slow cooker dishes are usually very freezer friendly. Slow cooker dishes work best with typically cheaper cuts of meat. Note: The ratio of coconut cream/milk to whipping cream is very flexible. Sometimes I only use coconut milk whereas the original recipe only called for whipping cream, so use what you have on hand. Using a food processor fitted with the metal blade, blend the onion, garlic, chili, cashew nuts, fennel seeds, cumin, coriander, and shredded coconut with 3 tablespoons of water until a smooth paste has been achieved. Alternatively, you could grind the dry ingredients to a paste using a mortar and pestle, and then mix in the 3 tablespoons of water. Heat a frying pan over medium heat. Add the oil and once the oil is hot, add the paste and fry for 5 minutes, stirring frequently. Stir in 2/3 cup of water, bring the mixture to a strong boil, and then transfer it to the slow cooker. Stir in the coconut cream/milk and whipping cream. Cover with the lid and turn the slow cooker on to the high setting. Cook for 1 1/2 hours. Then stir in the turmeric and a pinch or two of salt. Place the pieces of fish into the slow cooker, cover with the lid, and cook until the fish is just cooked through and flakes when pierced with a fork, between 30 minutes to 1 hour. Do not overcook the fish. Add more salt to taste if necessary, and stir in the freshly squeezed lime juice and fresh coriander. 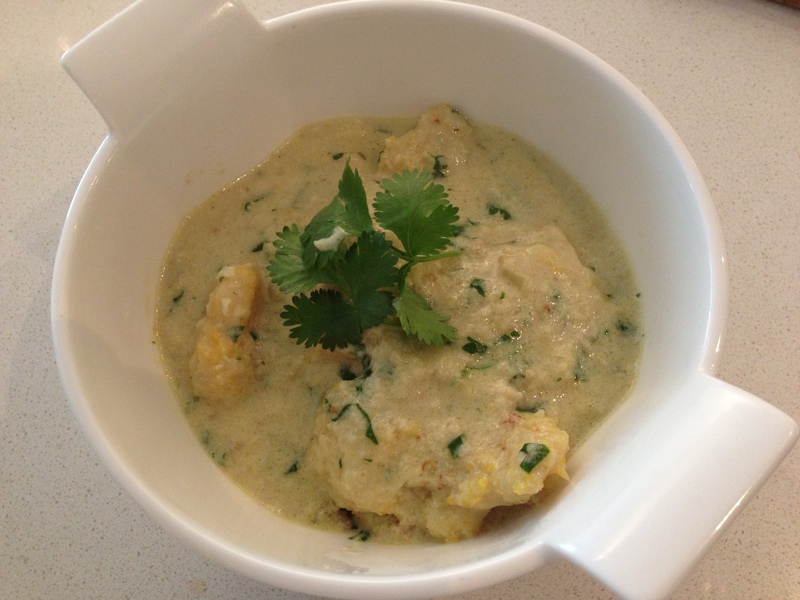 Ladle into bowls of white rice, garnish with fresh cilantro if desired, and serve immediately.